We're everything from tooth drillers to ditch diggers, Johnny Cash to kanYe West, kids in kindergarten to kids in college, plus everything in between. And on many warm weather weekends from early Spring to late Fall, we come together forming a magical amalgamation around a common passion. 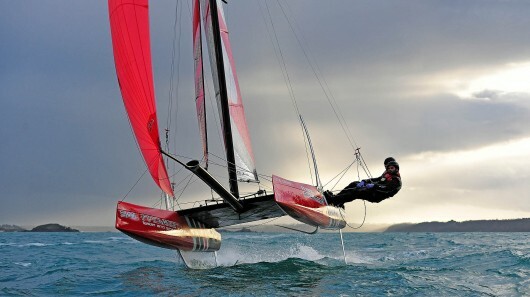 We're the Catamaran Racing Association of Wisconsin. Come join us! We tow our 16 - 21 foot cats to beautiful venues around the state of Wisconsin. Whether we're on the Great Lake that forms our eastern shore or one of the inland lakes gracing "God's Country," - there's one thing for sure. Everywhere we go, we have a can't-wait-for-the-next-one great time. We race on a handicap system, so it really doesn't matter what type of cat you sail. We've got national champions piloting some of the latest spinnaker'd hot rods, and novices who just need a little help knowing which orange thing to steer toward. Regardless of your experience or ability, you'll find the CRAW crowd to be exceptionally helpful and friendly. And if you're ready to really mix it up out on the race course, rest assured, you'll find plenty of competition, too!